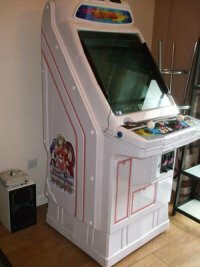 This C-MACC cabinet (also known as Complete – Multi Arcade Console Computer System in full) was specially designed to be the grand-daddy of all other arcade cabinets you’ve seen in your life ths far. What makes it stand out from the rest is its inherent ability to play virtually every emulated game available, in addition to non-emulated ones thanks to the inclusion of a PS3, Wii and Xbox 360 that are also neighbors with a decent PC within. From the outside, it looks pretty normal, but inside you’ll find a plethora of systems to put you in gaming nirvana. The entire C-MACC cost £5,000 to build.